Review: My Morning Jacket, 'The Waterfall' Beneath the band's musical strata is deeply ingrained spirituality. 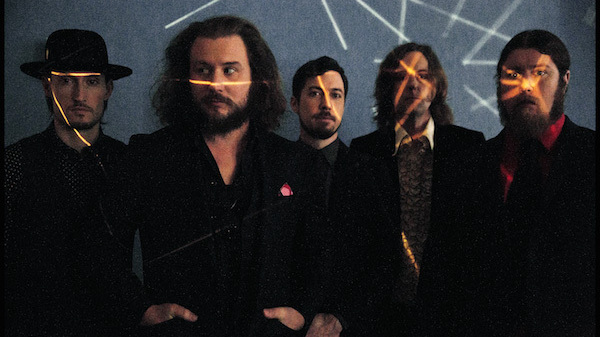 On its new album, My Morning Jacket directs its attention toward the natural world. There's an appealing inscrutability to the music of My Morning Jacket that continues on the band's new album, The Waterfall. The title of the new My Morning Jacket album, The Waterfall, is a metaphor for life beating you down. That's what frontman Jim James told Rolling Stone magazine. But in a gentler sense, the music itself is kind of like a waterfall — cascading notes, opaque layers of sound, and rippling arrangements that can bend or break the verse-chorus structure of traditional rock songs. There's an appealing inscrutability to the music of My Morning Jacket that continues on The Waterfall. The band has always plied decades' worth of rock, country, soul and jammy psychedelia without being any one of those things. And even though James' enigmatic vocals have wound their way through seven albums with My Morning Jacket, the things he can do with his voice grow increasingly remarkable. In "Believe (Nobody Knows)," he tucks words into unexpected points, toying with his phrasing in a way that adds weight to the overarching philosophy of his lyrics. Beneath My Morning Jacket's musical strata is a deeply ingrained spirituality, and on The Waterfall, it's directed toward the natural world. But even as he ponders the inevitability of nature, James points to the things we can control — the direction our lives will go, and maybe even our own happiness. After all, a waterfall can beat you down if you're standing right under it, but take a few steps back and it just might prove inspirational.